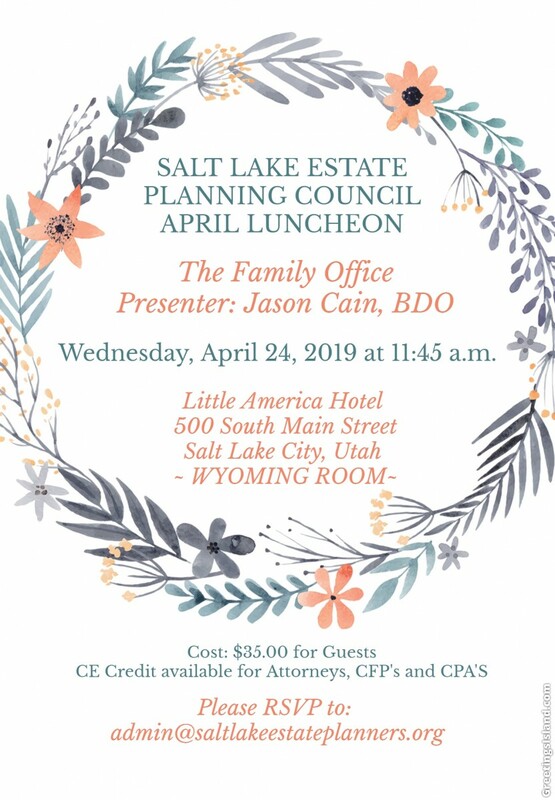 The Salt Lake Estate Planning Council draws its members from Salt Lake County, Utah. Our members practice in, or reside in Salt Lake City as Attorneys, Certified Public Accountants, Trust Officers, Insurance Agents and Financial Planners, all of whom are actively engaged in estate planning. We have monthly luncheons which are held on the third Wednesday of every month from September to May. The lunches begin at 12:00 p.m. and go for one hour. Our speakers offer a variety of topics while the friendly atmosphere gives our members and guests a chance to network and connect with other local professionals. If you are interested in attending our monthly luncheons, please see our calendar for more information. We hope you will find our website useful whether you are a member, considering becoming a member, or looking for a local estate planning professional to assist you. These legal practitioners lay the groundwork for a sound estate plan using wills, trusts, and other planning techniques in cooperation with other estate planning professionals. See our Member Directory for individual contact information. Certified Public Accountants give valued advice regarding the effect of estate and inheritance taxes. Their council and advice are an intregral part of the planning process. Their knowledge of the individual circumstances of your estate provides insight into the need for estate planning. See our Member Directory for a complete list of our CPA's ready to assist you. Trust Officers provide the services of corporate trustees who manage and oversee the day to day activities when corporate trustees are named. In addition they offer services as Personal Representative for estates, agent for trustees, custodian, employee benefit services, and transfer services. Our Member Directory can direct you to a local professional. Insurance professionals and financial planners add a groundwork of stability that is needed in estate planning by providing products that add liquidity to pay death taxes and provide for family care at death. They also lead the way in providing alternative resources using Irrevocable Life Insurance Trusts and other planning techniques. Individual information can be found using our Member Directory.